A new working paper is out! 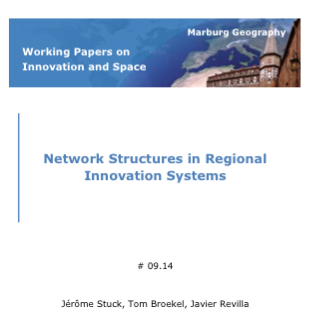 The title is „Network Structures in Regional Innovation Systems“ and it is co-authored by Jêromé Stuck and Javier Revilla Diez. It can be downloaded here. Abstract: While interactive learning and inter-organisational relations are fundamental building blocks in RIS theory, the framework is rarely related to investigations of regional knowledge network structures, because in RIS literature relational structures and interaction networks are discussed in a rather fuzzy and generic manner with the ‘network term’ often being used rather metaphorically. This paper contributes to the literature by discussing theoretical arguments about interactions and knowledge exchange relations in the RIS literature from the perspective of social network analysis. More precise, it links network theoretical concepts and insights to the well-known classification of RIS types by Cooke (2004). We thereby exemplarily show how the RIS literature and the literature on regional knowledge networks can benefit from considering insights of the respective other. This entry was posted in working paper and tagged network, network structures, regional innovation system. Bookmark the permalink.